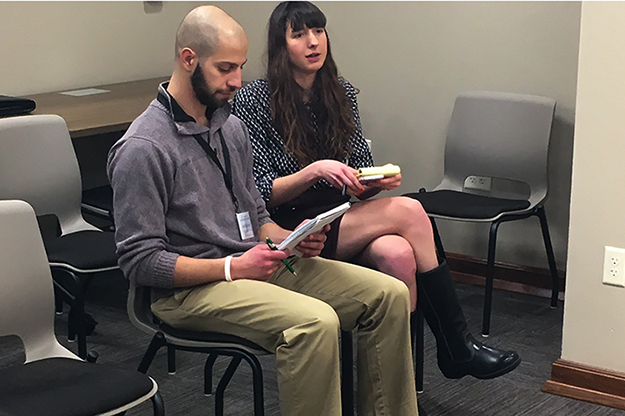 As North Dakota Newspaper Association intern reporters, Bilal Suleiman and Diane Newberry craft legislative stories that are distributed to roughly 90 papers across the state. Photo by David Dodds/UND Today. For Bilal Suleiman the first couple of days at the North Dakota Capitol unfolded in a haze. There was the drive to Bismarck, a new place to settle in, and a thrilling gig to take on as an intern reporter with the North Dakota Newspaper Association (NDNA). Together with fellow intern Diane Newberry, Suleiman is there to cover the 2019 legislative session. The two write stories that appear in small weekly papers across the state, which lack the manpower and money to string correspondents. Prominent dailies like The Bismarck Tribune also occasionally carry their narratives. 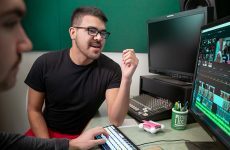 “I really like seeing the stories go out to tiny towns in North Dakota just because I am not from North Dakota, but I have been here for the past three and a half years and have really grown to care a lot about the state,” said Newberry, a Rhode Island-native who graduated from UND with degrees in communication and English this past December. Newberry and Suleiman, friends from UND who both worked for the student-run Dakota Student newspaper, enter the halls of the Capitol building every morning around 9. Suleiman usually heads to committee hearings, followed by debates on the floors of the State House and Senate. 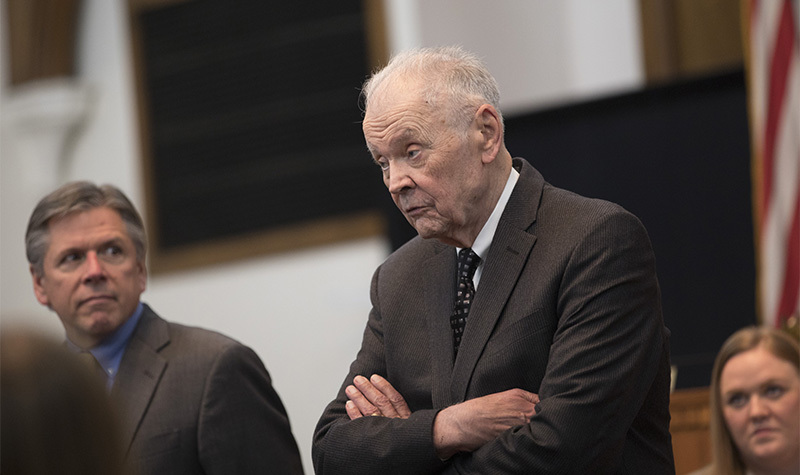 Committee hearings and floor debates at North Dakota’s Capitol comprise Suleiman and Newberry’s hectic schedules of reporting matters that impact the state’s future. Photo by David Dodds/UND Today. Sometimes, such happenings, also deliver entertaining tidbits that Suleiman and Newberry succinctly chronicle in a shared column, titled Capitol Chatter. By noon, on Mondays and Tuesdays, Suleiman joins Newberry for a call with Chuck Haga, a longtime award-winning journalist and lecturer at UND. Haga, who recruited Suleiman and Newberry for the NDNA internship, serves as their editor. On their calls, they discuss possible stories – usually three a week – and potential sources. Breaking, quickly-developing news is off their scope – by the time the roughly 90 weekly papers in the NDNA receive them, they would be stale tales. 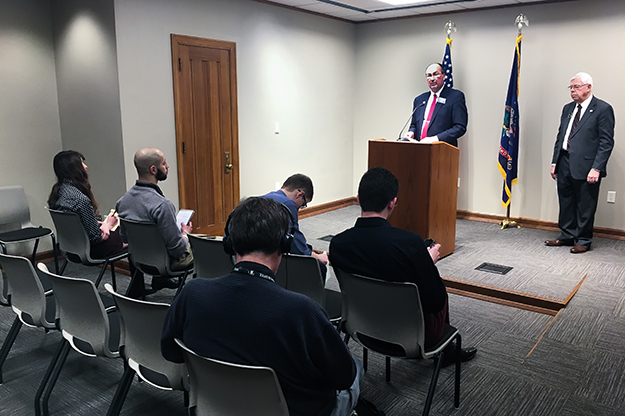 “We try to look beyond the daily stuff and identify issues that may be of interest if we go a little deeper into them,” Haga said, elaborating that rural matters often make the cut. On the morning of Feb. 1, hustling to meet NDNA’s submission deadline, Haga parsed that week’s stories once again. They came to him after Newberry and Suleiman spent hours doing research, working the phone, talking to people and ultimately crafting their copies. Newberry wrote about a proposal to institute dental therapy in the state on the backdrop of hard-to-access dental care in rural areas. She also penned an article on a bill that would mandate heightened background checks for school board members. Suleiman focused on behavioral issues in rural schools. By the middle of the following week, Newberry and Suleiman’s bylines would rest in print – an “awesome” occurrence when the next batch of articles would already be under way. 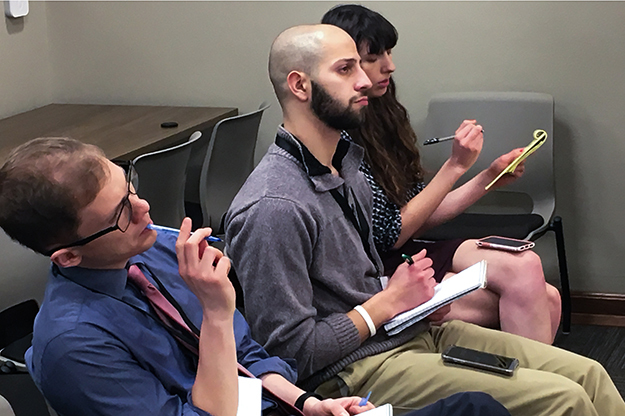 Having switched majors at UND, Suleiman (middle) says that reporting “must be my thing” after quickly taking to covering the 2019 legislative session. Photo by David Dodds/UND Today. The manner in which Newberry and Suleiman secured the NDNA internship, to an extent, mirrored the way they entered journalism. Both of them arrived at UND with plans for majors other than communication. Newberry pursued aviation, but by the time she obtained her private-pilot license, she sought to switch fields. English and journalism emerged as a newfound passion. Suleiman, who advanced from kindergarten through college in Grand Forks, followed a similar academic trajectory. He enrolled in occupational therapy at UND only to later discover his aptness for threading words together. UND Communication Program lecturer Chuck Haga, a retired Grand Forks Herald and Minneapolis Star Tribune writer, is mentoring Diane Newberry and Bilal Suleiman, two young journalists and communication program students, who are honing their craft at the State Capitol in Bismarck this semester. Photo by Jackie Lorentz/UND Today. He would not have discovered it, though, had it not been for Haga, who approached him with the opportunity. Newberry, who interned with The Grand Forks Herald last summer and graduated a semester early, shares the same fortune. 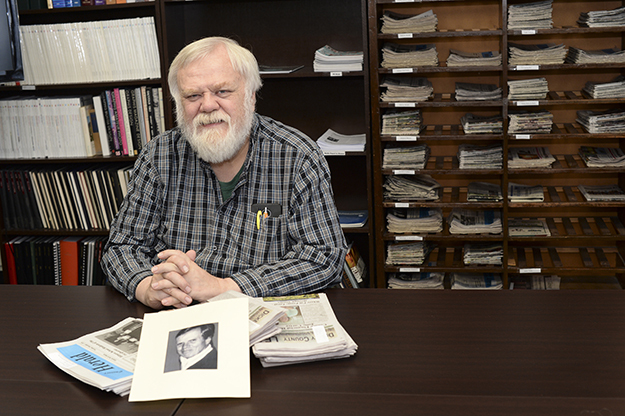 For his part, Haga, a veteran journalist with the Minneapolis Star Tribune and The Grand Forks Herald, enjoys supporting Newberry and Suleiman’s first solid steps into journalism. Will they venture further? Perhaps. Newberry awaits responses from several master’s programs in creative writing. She would be happy to work in a newsroom if she does not wind up in graduate school right away, she said. Suleiman is also eager to hone his craft, ideally landing a job with a local news media company. No matter what they seize in the future, what they’re doing now influences North Dakota’s present. 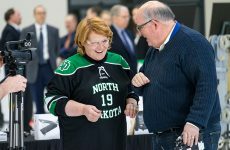 “These two folks are getting great experience and, at the same time, they are providing a very valuable service to the people of North Dakota,” said Haga.